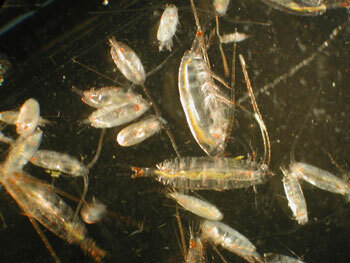 The problem is that these nutritious plankton Woodstocks are few and far between, and they materialize unpredictably. 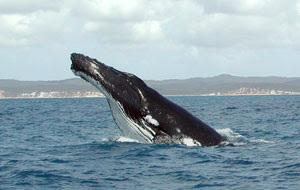 So what’s a hungry humpback to do? Julie Hagelin has been giving the question some thought and that’s why she was conjuring up Ephemeral Swarms of Zooplankton this past Friday at the AChemS conference. She drew an analogy with tubenose seabirds such as storm petrels, which use the scent of dimethyl sulfide (DMS) to locate areas rich in the tiny planktonic crustaceans on which they prey. What if a baleen whale sampled the air when it breeched, and headed upwind if it smelled DMS? Hagelin et al. plan experimental tests of DMS to confirm their hypothesis. Talk about eating habits of your megafauna. This could be interesting. The abstract discussed here, “Baleen whales and tubenose seabirds—A colossal chemosensory convergence?” by Julie C. Hagelin, Janice M. Straley, Lindsey B. Nielson, and Andy Szabo, was presented at the Association for Chemoreception Sciences annual meeting in Huntington Beach, California on April 27, 2012. The abstract can be found here.